2Pause: Tanlines’ “Brothers” interactive promo by Weird Days The experimental Brooklyn indie-rock/electro-pop duo, Tanlines, is just the latest in a string of musicians tapping into interactive 360-degree technology to bring audiences a cutting-edge experience. With a power to rotate the screen in the catchy pop single, Brothers, viewers literally have a window into the recording studio built by Tanlines’ Eric Emm and his brother, Joshua Ryan. How you interact in this music video created by Weird Days is entirely up to you. Shift perspective, watch the TV, stare at the fish tank, hang out with percussionist/keyboardist Jesse Cohen, or be really nosy and peek into what’s inside those grocery bags on the floor. Only thing you can’t do is click on the items inside. So how about taking the room for a spin yourself? Tanlines is on the new album, Mixed Emotions, out March 19th in the UK and March 20th in the US. 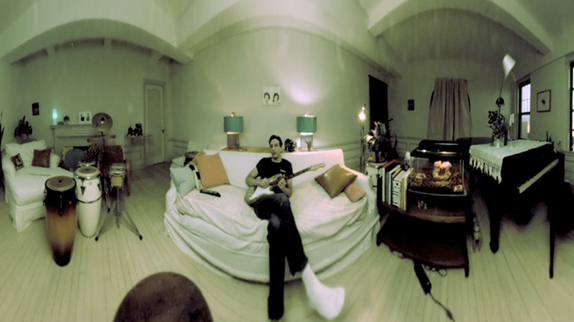 The experimental Brooklyn indie-rock/electro-pop duo, Tanlines, is just the latest in a string of musicians tapping into interactive 360-degree technology to bring audiences a cutting-edge experience. With a power to rotate the screen in the catchy pop single, Brothers, viewers literally have a window into the recording studio built by Tanlines’ Eric Emm and his brother, Joshua Ryan. How you interact in this music video created by Weird Days is entirely up to you. Shift perspective, watch the TV, stare at the fish tank, hang out with percussionist/keyboardist Jesse Cohen, or be really nosy and peek into what’s inside those grocery bags on the floor. Only thing you can’t do is click on the items inside. So how about taking the room for a spin yourself? Tanlines is on the new album, Mixed Emotions, out March 19th in the UK and March 20th in the US.